Think Tetris with physics and rotational gravity. No different shapes though, only square blocks, and the occasional combo. Actually, don't think Tetris at all, that would be silly. If there is any specific variety of game type that could be the most common in all of mobile games, it would probably be the puzzle genre. Embracing the casual gamer mentality, puzzle games have been adopted almost universally in the mobile field, and as such, most handsets are going to ship with at least one puzzle game included. Vivendi Games Mobile is no slouch; they've seen this trend, and amidst all their other titles, they're preparing a new puzzle game to spruce up an already concentrated mixture. Enter Shock Blocks, an interesting take on a puzzle game in which clearing the field of blocks is the main goal. The game opens to a selection of two separate modes, Puzzle and Arcade. Each mode is going to use the same block clearing gameplay structure but with separate rules. The puzzle mode has no time limit, and the objective of the gameplay is to clear the screen of ever single block. Arcade mode, on the other hand, is going to have a strict time limit in which players must clear as many blocks as possible, so as to achieve a specific goal and progress to the next level. The most interesting part of Shock Blocks though, is that players won't actually be moving the blocks at all. The concept of Shock Blocks is one of gravity. In order to move the blocks players are attempting to clear, they'll be forced to rotate, flip, or shake the world in different directions. There are five movements in total, and they are rotating the field to the left, rotating the field to the right, flipping the field vertically, and shaking the field to the left or right. Rotating causes the blocks to fall onto what was previously the left wall of the level, while flipping inverts the top and bottom of the level. Shaking the field is akin to tilt in a Pinball machine. The shake maneuver slides every block to the left or right one square. All of these movements make for a genuinely complex variety of puzzles and ways in which to solve them. Players will be forced to rotate the field to the left, then shake everything one square to the right, flip things vertically, and then rotate to the right in order to clear all of the blocks. It's hard to see the entire course of solving a puzzle in the beginning, and it makes for interesting gameplay. In order to stop players from consistently manipulating the level in Puzzle Mode, there are only a certain amount of moves allowed in each puzzle. The number of allowed moves increases as the puzzle grows more complex. Arcade Mode has no limit on the amount of moves, but hastily spinning and flipping the level out of control might still make things a lot worse for the player. Blocks are cleared from the levels when they collect in any instance in which three blocks of a similar color are touching, whether it is a straight line or an L-shape. 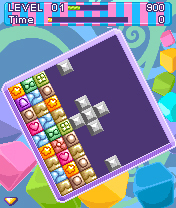 The game labels this a shock chain, and blocks in this situation are said to be charging. If players are quick enough to bring other blocks together as this occurring they can build a combo chain, and achieve more points. This seemed pretty inherent to the Arcade Mode, as building chains and attempting to movie quickly didn't match the gameplay particularly well in the calm, thoughtful stages of Puzzle Mode. 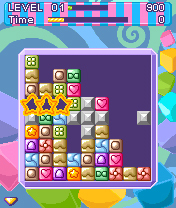 As the levels in Puzzle Mode progress players will face more blocks and a larger variety of colors. However, Arcade Mode is loaded with colors at the onset, and players will have to wade through a myriad of different colored blocks to try and obtain their matches. There are even the occasional special blocks, in Arcade Mode only, which will change the nature of the gameplay, including the 1 Ton Block, the Star Block, and the Time Bomb block which, if not used in a shock chain, will turn all the surrounding blocks to stone blocks. The preview build of Shock Blocks had the occasional hangup, all of which could probably be written off as the course of developing software. Blocks would occasionally not form their shock chains even when grouped in three, menus were difficult and instructions were often cut-off while navigating with our Sony Ericsson K750i handset, and there was never any sound or vibration within our playing time of Shock Blocks, two things which were suggested at the onset of the game. None of these problems seem like things that will persist when Vivendi Games Mobile ships this title mid-July.